There’s a lot of reasons to be impressed with the recent Tomb Raider reboot, and chief amongst those reasons is the story – it shows us for the first time a uniquely relatable version of Lara Croft, and then spends the game destroying her to make a point. 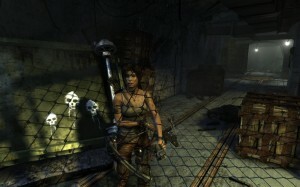 In the game’s first area, Lara is barely capable of defending herself and portrayed as incredibly – beautifully – human. As the story draws to a close, she’s a much more proficient combatant and her enemies have been laid to rest, but she’s broken. She wants to uncover mysteries through athleticism and violence. She wants to peel back the corners of civilisation and peer underneath. She’s become the sort of person that wants to raid tombs for living over a series of 21 other games, and that’s probably not the sort of person you’d want to have dinner with of an evening. Lara goes from being a believable, relatable facsimile of a human being to the tight-lipped backflipping badass of her mid-90’s adventures. At the end of Lara’s story, she’s a much less engaging character than she was at the start. But what does that say about her? In recent games that handle similar themes – such as Spec Ops and FarCry 3 – the interesting part is the change. At the start of each narrative the white-bread male lead is unmoulded and uninteresting, a blank canvas to take whatever story the author has in mind. But they’re one-dimensional, still, deliberately, as theirs is a big story to tell and the brush strokes required are pretty broad. At no point do Spec Ops’ Walker or FarCry’s Jason seriously question their actions, or fall onto the back foot. They are active participants, pushing through the violent worlds to achieve their goals no matter the cost. Perfect video game protagonists, in other words. Why are they fighting? Because there’s stuff to fight, obviously, because men are still alive and that just won’t do. By the time Lara shifts to that viewpoint – when she stops running and decides to brave enemy forces for a second time and becomes an aggressor – she’s no longer interesting. And that’s perfect. That’s fascinating. Everything that was so carefully established to be human about her is blasted away. Enemies start to run from her in fear. We move from stealthy fights in tight confines to drawn-out gunfights across multiple fronts where Lara screams threats at her enemies while she launches grenades across the battlefield. Once Lara’s become who she’s supposed to be, canonically, you can stop giving a damn about her character and just steer her through the violence. Where Spec Ops and FarCry 3 are games about making – however wrong that making might be, whatever gore-stained lunatics might emerge – this is a game of unmaking. 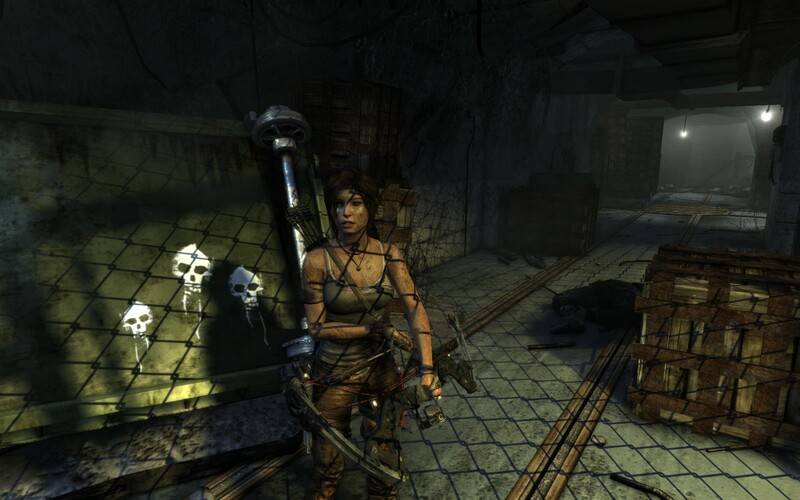 The personality of Lara Croft is unmade as the game progresses and she’s left as a bare avatar on the screen, a channel for story to happen through. It seems that this isn’t a game expressly written with a sequel in mind, because we all already know what the story is going to be after this point. This is a distinct narrative packet designed to slot into the existing canon. There’s something wonderful about that; a well-written story that’s designed to warp and twist the characters out of any shape that we could relate to. A mangle for protagonists. An anti-hero machine. Lara is unmade through violence. Tomb Raider is an impossibly violent game, in that Lara simply could not survive the stuff that happens to her. Quite aside from being shot every ten minutes or so – which as a culture we’ve pretty much agreed doesn’t count unless it happens in a cutscene – she is subjected to unbelievable amounts of punishment. She’s impaled more times than is strictly healthy for a woman of her age. She has her throat cut with a machete whilst hanging upside down. She cracks her head open on rocks. She’s gored by wolves and choked unconscious. It’s a testament to the realism of Lara’s portrayal that these deaths are so striking and memorable as individual events. 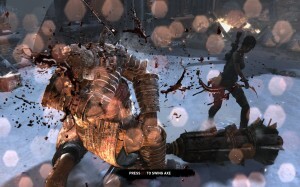 Later on in the game, Lara unlocks brutal executions of her own that the player can perform to gain bonus XP – but there’s very little reason to do so, as most of the skill upgrades have already been purchased. For all the XP they offer, they’re eventually as valid a mechanical choice as the variety of close combat counter-kills available to Mr Cent in 2008’s Blood on the Sand. There’s almost no point in performing these acts save watching Lara mess someone up in a particularly gruesome way. If they were a part of early-to-mid- gameplay, they could inform levelling strategies – but once they show up, part of the story is over. There’s no hero’s journey left, anymore. The hero defeats her enemy – the weak part of her, the human part – and by doing so ends the story. We just stick around to see what happens after and take control of the mayhem. 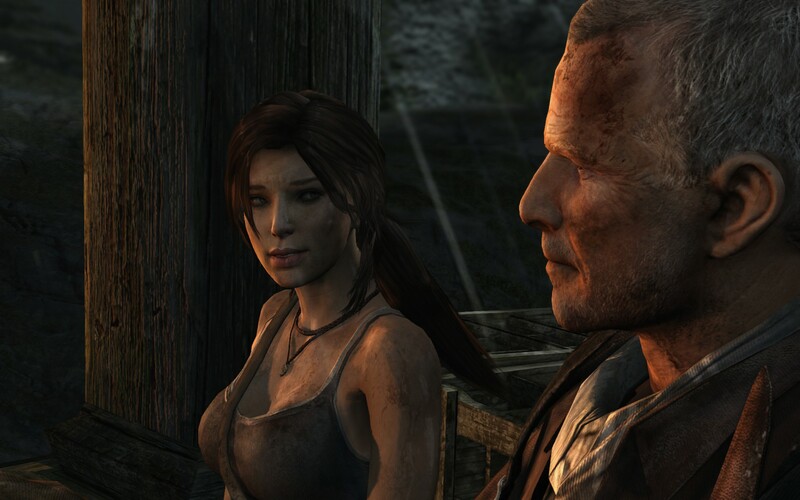 These deaths – both at Lara’s hand and performed upon her by the game, both accidental and deliberate, both great and small – don’t all happen in story canon. The canonical ending is the one where Lara escapes the island alive. But they’re shown to us. The amount of up-close and personal violent deaths witnessed by the player is telling. Every death takes us away from the wide-eyed, clean and innocent Lara at the start and towards the blood-caked murderer at the end. All of this is a comment on how the industry has progressed and how we’ve yet to go; the heroes of old are emotionless dolls designed as environment suits for players to experience the game. Even iconic ones like Link have barely progressed since they were shuffling about in two dimensions – he’s not a character, save as an amalgamation of experiences we’ve collectively layered over multiple incarnations of him. Same with Mario. Samus Aran. Gordon Freeman. Agent 47. This space left intentionally blank so not to jar with user immersion. And that’s all fine, of course, and in some cases – sprawling open-world games like The Elder Scrolls or Fallout series – better than the alternative. But it should no longer be the default, and Tomb Raider draws attention to that. Lara Croft starts as a top-drawer 2013 videogame protagonist – excellently voiced and acted, perfectly animated, and so on – but devolves through scene after scene of murder into something less whole and more unreal. She’s rewritten into a dead-eyed caricature. She’s returning to her roots, and her roots are a shallow place. Rhianna Pratchett’s commentary on games of old should be commended, as it’s easy to gloss over in the midst of all the gore. She’s turned Lara Croft, the poster child for hollow protagonists, into a frighteningly rare example of a non-sexualised, believable female character – and then she’s undone all that, too, to make a point about where we stand as an industry.